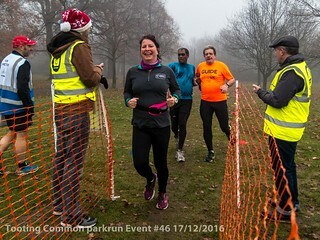 Saturday was the final parkrun of 2017 so there was no way I was missing it. 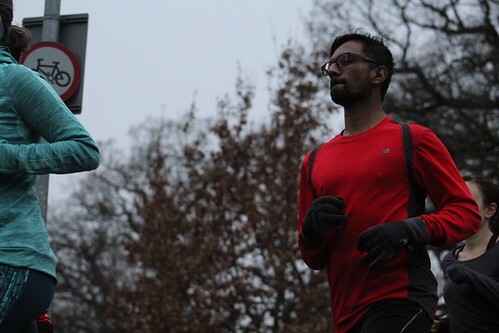 A chance to get in some much needed miles before the end of the year, a year which for me has been up and down with a hip injury, pulling out of events and general running disappointment. 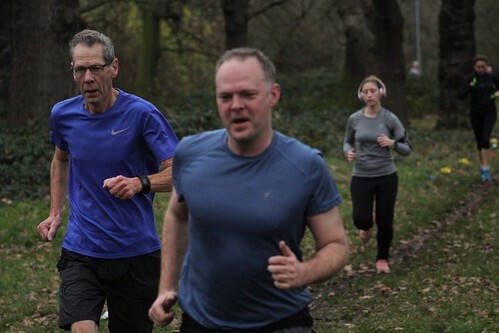 Thankfully I’m getting back to regular running and parkrun has been a great motivator over the past six months. It’s now a firm fixture in my week, and finally all 4 of the “Glasford Massive” have taken part - hurrah to Ben! The course today was wet and windy and the run was as “enjoyable” as ever but I gave it one final push and was pleased with my time. Nowhere near my PB but I’ll be working on that next year! I also volunteered this week which is a great way to support the event and meet people. 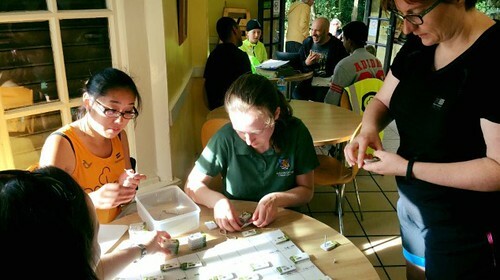 I’d really recommend it, even just hanging back afterwards with a coffee while sorting the tokens is a great help and gives you chance to mull over your performance with your fellow participants. Now for the stats…. 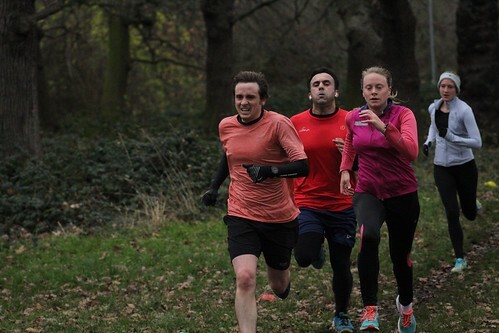 In a field of 269 participants we had 34 new runners – 16 of whom ran their first parkrun. There were also representatives from 27 different clubs taking part. A fantastic 23 of you achieved PBs. And only one missing finishing token! Nick Bester of Boksburg AC was our first male finisher in 17.03, an unknown runner took second place and Matthew Cartwright of Herne Hill Harriers finished third in 18.39. 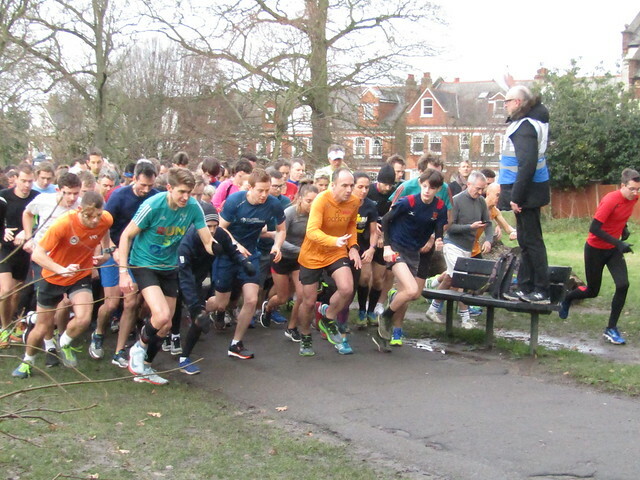 Lucie Custance of Clapham Chasers was our first female finisher in 18.02, which is her current course PB. 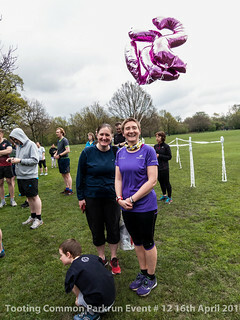 A first appearance for Lois Bond of Windsor, Slough, Eton & Hounslow AC brought her second place in 20.10 and Ann Brennan, another Chaser, came third in 20.38. 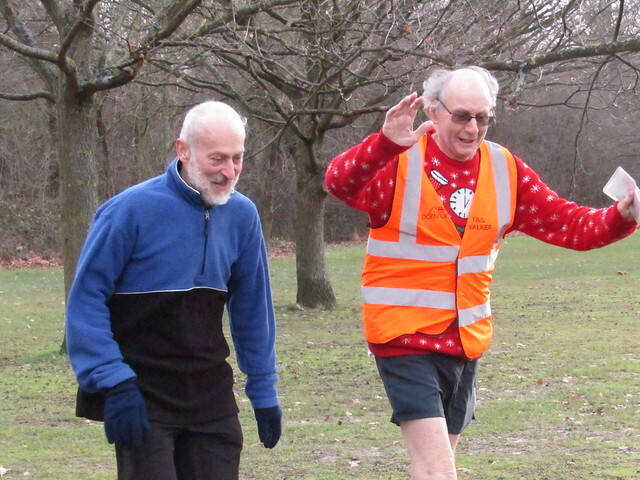 Many congratulations go to Roman Makarov and Michael Tay who both ran their 50th Parkrun today. 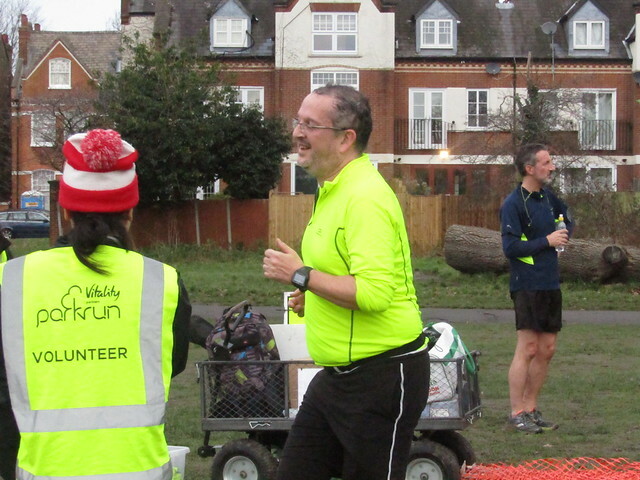 Great stuff also from Ken Willis who marked completing 1000kms of running over the course of 2017 with a 23 sec improvement on his course PB to 24:22. 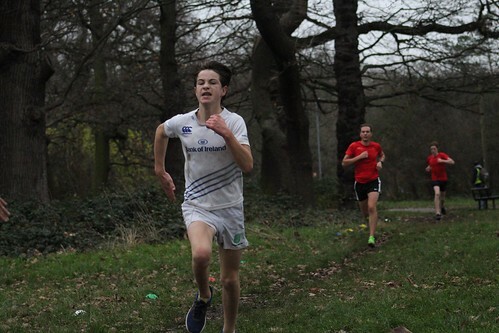 Junior runner Samuel Eastoe continued his good run of form today by bettering the time he set a fortnight ago by a massive 2 mins 2 secs and has a new PB of 23:40. 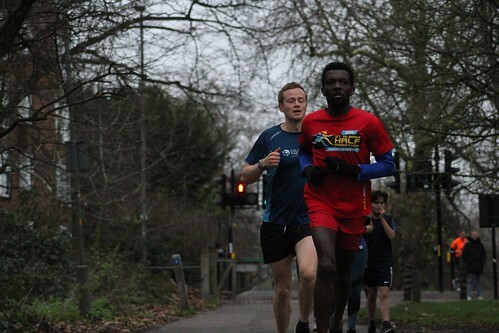 Scott Patterson went sub 25 for the first time, improving by 30 secs to 24:56, and Vee Bebe recorded his third successive PB, which at 26:13 is an incredible 4 mins 46 secs better than his time at the start of December. 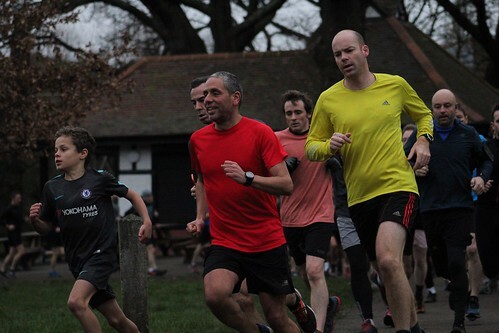 But the honour for biggest improvement of the week went to Dan Booth, who got round in an amazing 4:51 seconds quicker than at the end of last month and has a new PB of 22:08. Sai-Yee Lam • Liam O'Hare • Ruth Slater • Michael John Morfey • Damien Wilson • Ninette Fernandes • Duncan Alastair Richmond Turnbull • Belma Kapetanovic • Ross Brown • Mark Shotton • Abigail Hermon • Ruth Jean Chalmers • Brigid Walters • Michael Wiggins • Tom Baker • Andrew Craven • Robert Street • Cecilia Bogle • Stuart Hamilton • Holly Hamilton • Helen Stephenson • Catherine Da Graca • Stiainin Jackson • Kirsten Olson. Marvellous work everyone! I look forward to seeing more fabulous running from us all next year! 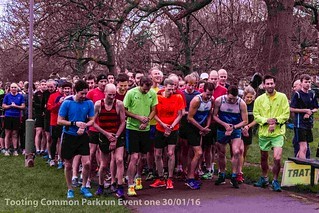 Wishing you all a very Happy New Year and best wishes for a 2018 full of running, happiness and volunteering fun!! 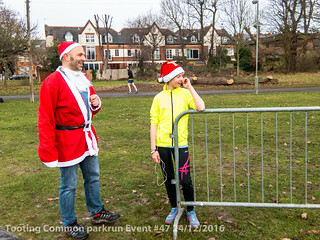 As the dawn of the day came upon us for the final day of 2016, runners and volunteers appeared out of the mist, ready to rumble with a laugh, smile and festive cheer! 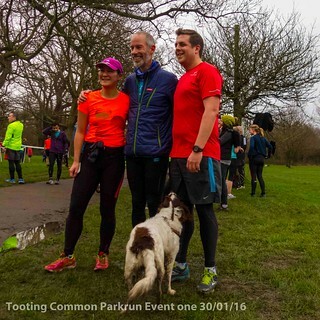 A lot has happened in the past year at Tooting Common parkrun, an amazing experience bringing the community of Wandsworth together as well as neighbouring towns. We have had all sorts of people participating in all occasions. 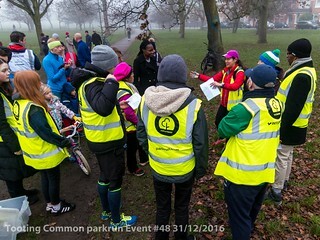 Whether the elements were wet, windy, foggy or sunny the volunteers and runners turned up in their 100s! We’ve helped children achieve their Duke of Edinburgh Award through having them partake in volunteer roles. 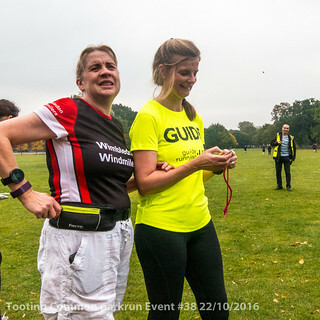 And as the event became more popular, blind or partially sighted runners began running the course with their guide runners too. 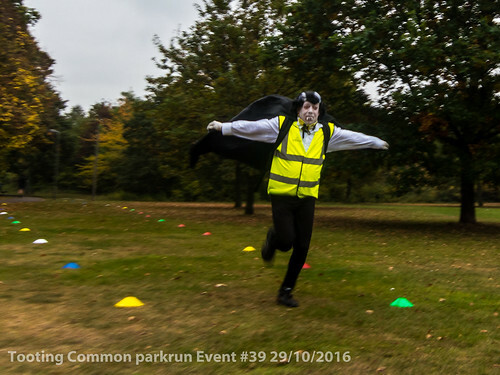 We have even had participants in all sorts of costumes, from Dracula outfits to running reindeers! 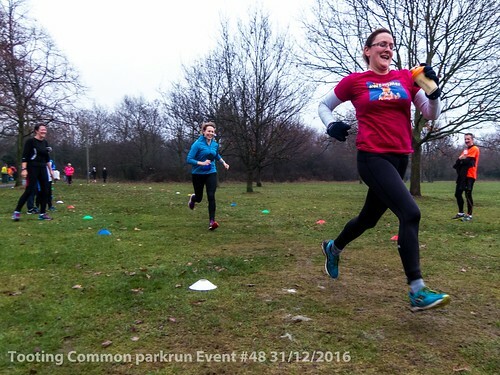 The main thing is that we have brought lots of fun and smiles to people becoming active in 2016. 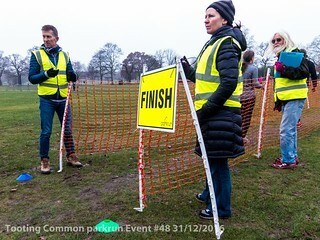 With nothing stopping Tooting Common parkrun, no obstacles too deep, no problems too big, from missing finish funnels to borrowing finish tokens from another parkrun. As the saying goes, the show must go on! We don’t have statistics on the amount of coffee, teas, hot chocolates and cake consumed at the local café afterwards but it sure was tasty and it was where the reminisce of each run took place whilst tokens were sorted and results were processed. Thanks to you all for joining us. 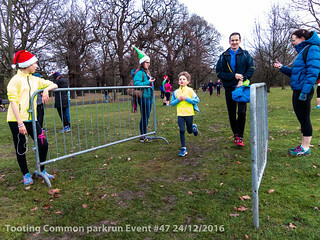 Congratulations on whether you ran, jogged, walked, volunteered or supported with a great smile beaming away for everyone to see! 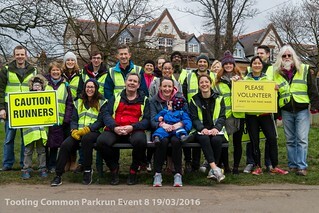 You superheroes helped ensure Tooting Common parkrun could take place every Saturday morning in 2016!! 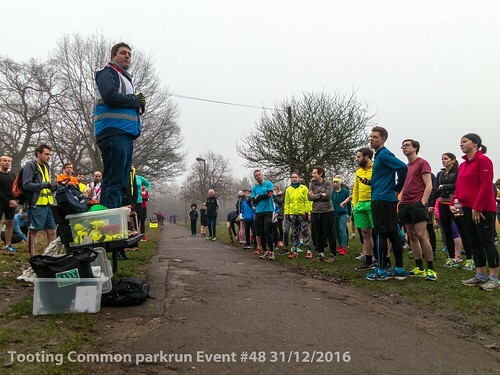 And so on to the New Year’s Eve of 2016, our 48th event which brought us 285 runners lining up for a 5k slightly foggy run at Tooting Common… 58 first timers which is impressive over the festive period, and an amazing 45 people managed to record a personal best. Well done to you all!! 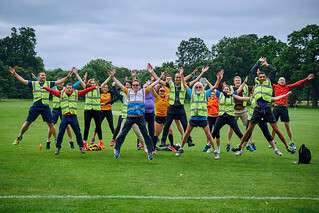 A huge thank you to the fabulous team of 31 volunteers with smiley faces and words of wisdom, from the Run Director’s announcement to the encouragement of the marshals dotted around the course, the team based around the finish funnel right through to our chirpy barcode scanners!! Fantastic achievement from our junior runners Cameron Abbasian, Zachary Brown and Jessie Turner, who in the junior category completed their 10th run with us in times of 22:38, 31.22 and 38.45 respectively. 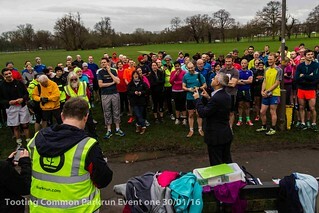 Well done to Jatan Hunjan, running his 3rd ever senior parkrun and obtaining a Personal Best (25:06) on every occasion! 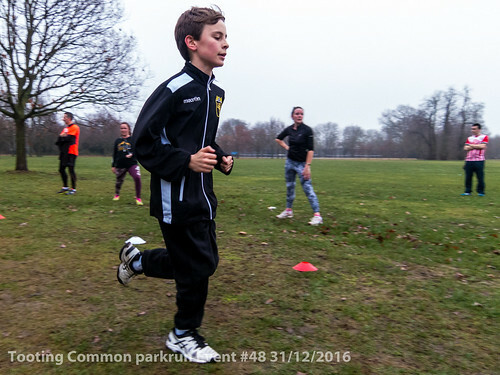 Also, bravo Ken Willis, on achieving a max heart rate of 192 (bpm) which obviously paid off through achieving a Personal Best of 25:07! 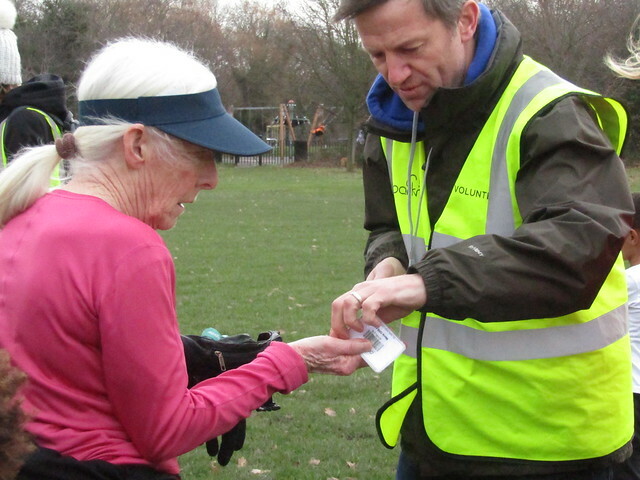 Clare Janew, who has been with Tooting Common parkrun since the very beginning, obtained a PB of 27:11 – great job!! was first over the line in 17:20 - first appearance. 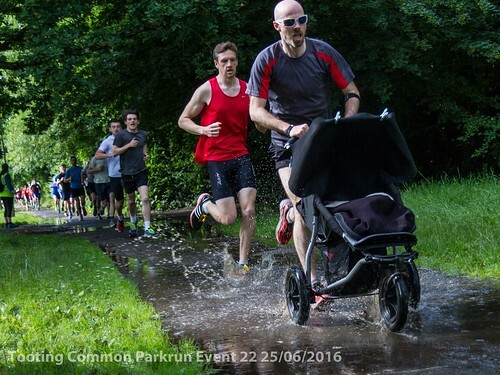 Jonathan BEATTY (VM35-39) of Kent AC, was second over the line in 17:53.
line in 19:41 - first time in 10 appearances. Andrew THEEDOM (Unattached) 2514 pts. Jaspal DHALLEY (Unattached) 1795 pts. Ross BROWN (Unattached) 1665 pts. Sai-Yee LAM (Unattached) 2405 pts. 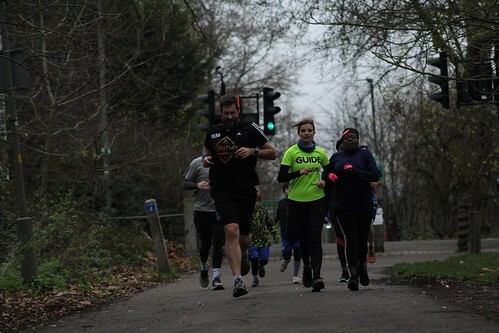 Marie-Anne WONG (Clapham Runners) 2282 pts.